Sometimes the best discoveries come from happy accidents. 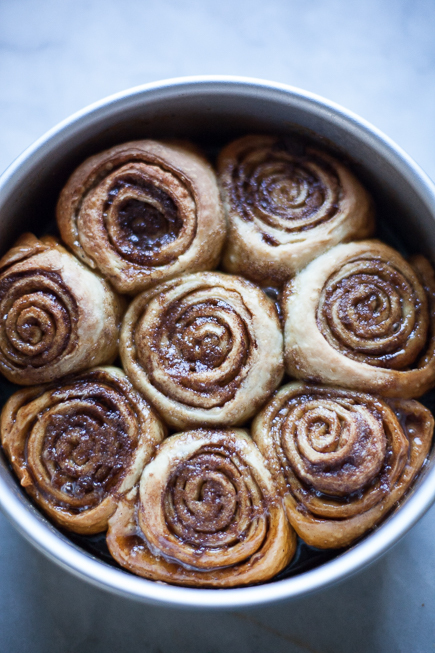 I made a pan of caramel cinnamon buns and I was the only one home to eat them. 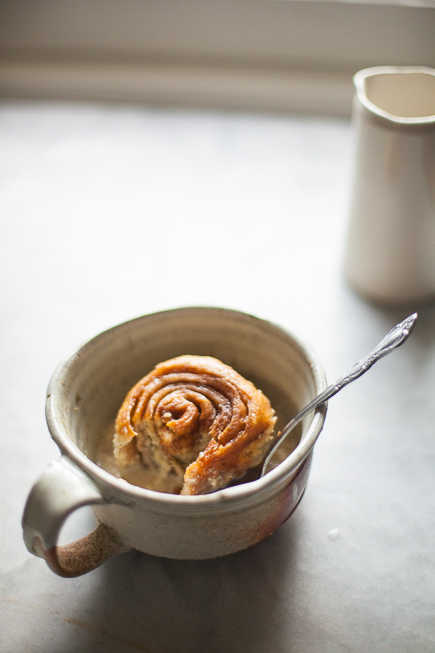 That in itself is no great tragedy, I took great pleasure in sitting down with a cup of coffee and a warm sticky bun in the perfection of solitude. 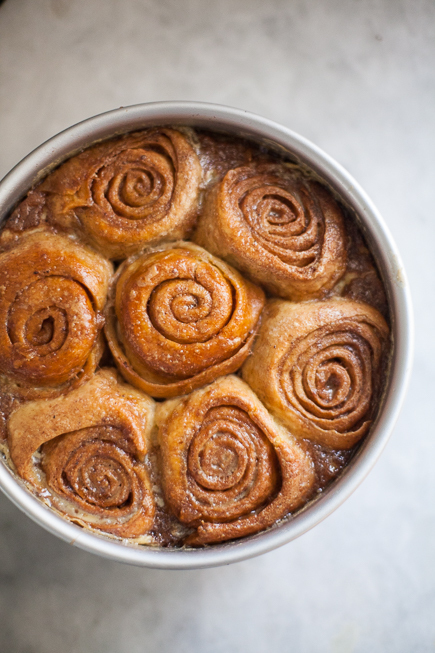 But, the day went by and the kids were busy with sports, finals and all that kids are busy with, so I found myself with a pan of lovely, albeit slightly stale rolls. My boys would have happily devoured them as a midnight snack, but for my taste they were a bit stiff, after 12 hours on the counter. 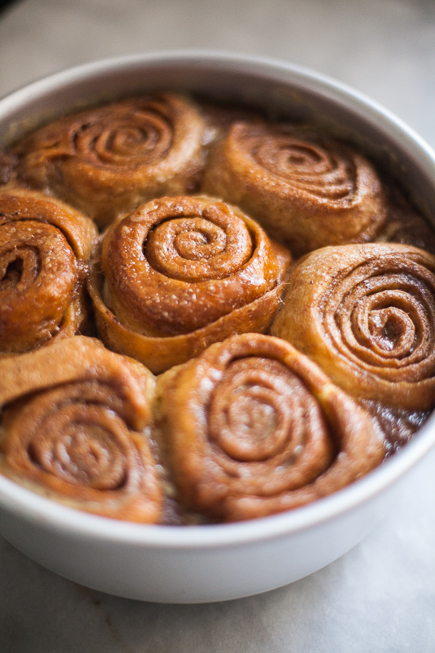 We talk about using stale bread for pudding in our books, that’s not news, but this recipe elevates a rather humble dessert to a special occasion by using sticky buns. I just put the sticky buns right back in the cake pan, with the caramel and all, then covered it with custard. I baked them and a new classic was born in my house. 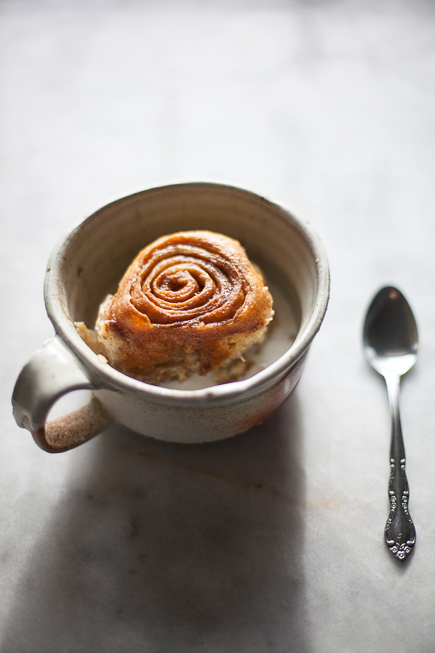 I served the pudding as dessert, but they are also perfect for breakfast or brunch. 1 1/2 pounds brioche dough – I used the recipe from The New Artisan Bread in Five Minutes a Day, but you can use Healthy Bread in Five Minutes a Day or the Gluten-Free Artisan Bread in Five Minutes a Day as well. Mix together the sugar, brown sugar, cinnamon and zest in a bowl. Divide the sugar mixture in half. Brush half the butter over the rolled out dough. 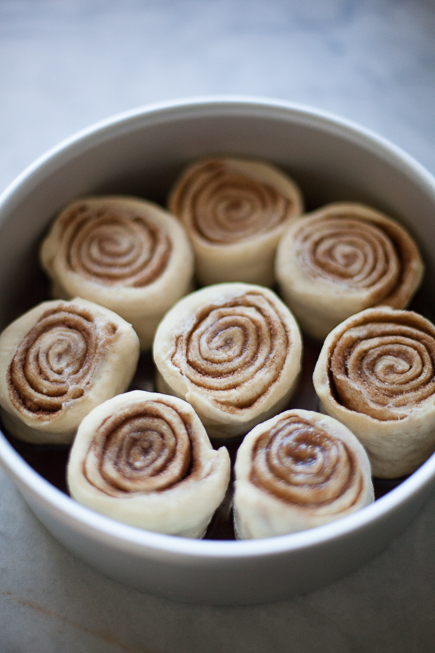 Here is the technique for creating the cinnamon rolls. Mix together the remaining sugar mixture and butter, then spread it over the bottom of a Cake Pan, 8-Inch x 3-Inch (if you don’t have one with such high sides, use a 9-inch pan). Place the rolls over this sugar butter mixture. Bake at 350°F for about 25 to 30 minutes or until just set in the middle. If you want to make the bread pudding you can skip this stage, but I wanted to show you what they look like inverted onto a plate. Pretty, pretty, pretty little sirens. Go ahead and eat one before you make the pudding, it just makes more room for the custard. 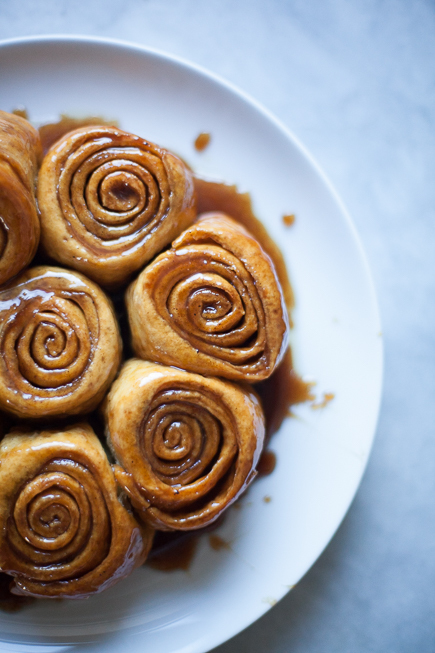 If you’ve inverted the buns to sample one or two, then put them back into the pan, with the caramel, to make the pudding. 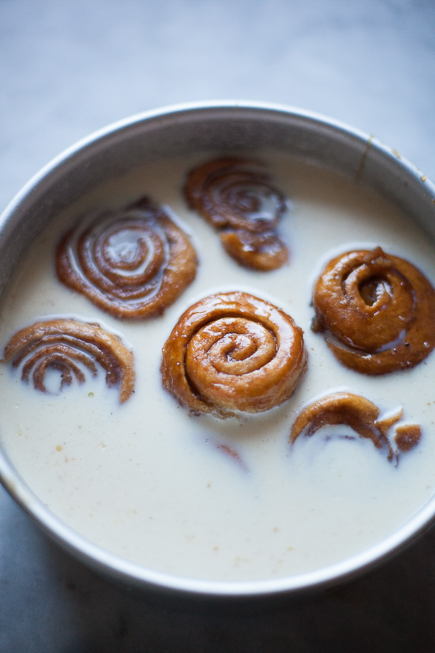 Mix together the custard and pour it over the baked cinnamon sticky buns in the pan. Let them sit in the custard for at least 30 minutes, but you can refrigerate them overnight. Bake until the custard is just set. 30-45+ minutes. The time will depend on the temperature of the custard and buns. Serve them warm or room temperature. I poured a bit of half-and-half over them, but you can top with ice cream and/or fruit. The cup made by my pottery instructor Kevin Caufield.